Luxury, impeccable service, and gourmet food awaits at this all inclusive resort. The Dreams Tulum offers families, couples and singles the perfect beachfront setting for the ultimate getaway. 6 restaurants, 24-hour room service, 7 bars and a white sandy beach awaits. Only minutes from the famous Mayan Ruins, you can explore the best the area has to offer. 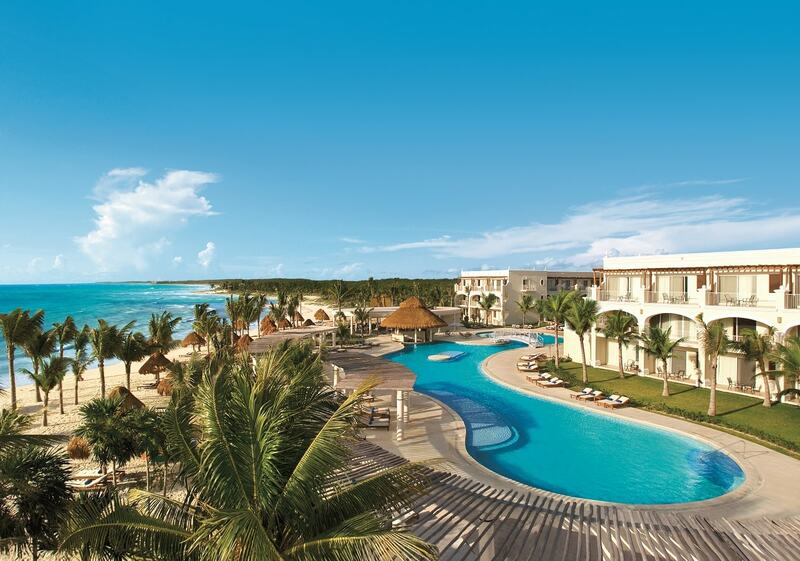 Guest rooms and suites, all with Mexican contemporary decor await at this luxurious resort. The rooms offer garden or ocean views and they all have either balcony or terraces. Guestrooms offer one king bed or two double beds, air-conditioning, an IPOD docking station, and twice-daily maid service. The mini-bar is stocked daily and 24-hour room service is included. If you want a little extra luxury, you can opt for the Preferred Club, which includes: private check-in and check out, an exclusive Preferred Club lounge with daily continental breakfast, afternoon hors d'oevres, delectable dessert options and fine liquors. The preferred club also includes upgraded amenities. The Dreams Tulum also offers an adults-only section. 222 recently renovated rooms offer garden and ocean views in an 18+ section of the resort. Enjoy breakfast, lunch and dinner at the World Cafe, a buffet with continental cuisine. Vegetarian and gluten-free options are available. You can enjoy delectable dessert and specialty coffees all day at the Coco Cafe. For a poolside lunch, head to the Barefoot Grill. Dinner-time also offers various specialty restaurants. El Patio serves up authentic Mexican dishes and Portofino offers the best of traditional Italian cuisine. Himitsu will please you if you prefer Asian delicacies and you can also check out the Gohan sushi bar. The seaside grill should be on your list if you prefer surf and turf options. Finally, the French cuisine served at the adults only Bordeaux restaurant cannot be missed. 24-hour room service is also available. Explore other AM Resorts with the fabulous, Sip, Savor & See option. Concierge can assist you with making a reservation at the participating resorts, where you can enjoy your evening meal and the evening entertainment. Transportation not included. Whether it is a family reunion, an incentive group or a corporate event, we have excellent group rates and personalized service. Contact us for more information. The Dreams Spa by Pevonia offers pure indulgence. Choose the hydrotherapy circuit, a wide variety of massages, facials and other spa services. They also have a Temazcal available if you wish to participate in this Mayan healing ritual. The Explorer's kids club offers a wide array of activities and entertainment for kids aged 4-11. From a camp-out, to arts & crafts and big-screen movies on the beach, your kids will have fun while you get some well-deserved 'me' time. The kids club also offers evening hours, so you can enjoy an adults only meal.